Venezuela's President Nicolas Maduro, center, stands with his Defense Minister Vladimir Padrino Lopez before giving his annual address to the nation to members of the Constitutional Assembly inside the National Assembly in Caracas, Venezuela, Jan. 14, 2019. 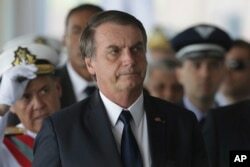 Brazil's President Jair Bolsonaro arrives for the inauguration ceremony of his new naval commander, Ilques Barbosa Junior, at the Naval Club in Brasilia, Jan. 9, 2019. Brazil on Saturday said it recognized Juan Guaido, head of Venezuela's opposition-run Congress, as legitimate president after Maduro was sworn in to a second term that countries around the world described as illegitimate. "Over there we've got Brazil in the hands of a fascist — Bolsonaro is a Hitler of the modern era!" Maduro said during a state of the nation speech. "Let's leave the task of Bolsonaro to the wonderful people of Brazil, who will fight and take care of him." The Brazilian president's office said through a spokeswoman that it would not comment. FILE - Juan Guaido, president of the Venezuelan National Assembly delivers a speech during a public session with opposition members, at a street in Caracas, Venezuela, Jan. 11, 2019. 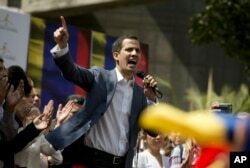 Guaido on Friday had said he was willing to assume the presidency after opposition leaders said Maduro's second term was illegitimate because the broadly boycotted 2018 elections were rigged in his favor. Brazil and Venezuela maintained cordial relations for over a decade thanks to friendly ties between Brazil's Workers Party and Venezuela's Socialist Party. Bolsonaro, a fervent anti-communist who has praised his country's 1964-85 military dictatorship, has promised to target Venezuela.